We stopped at Eden Springs an ancient Jewish town that has a clear water spring. After driving back across the Hula Valley, we then drove through the Biriya Forest where we were able to take in the views from the mountain looking into the Hula Valley, the ancient location of Amuka and the modern day location of Amuka. We visited the remains of a 1800 year old synagogue and Rhonda also took me to the grave of Rabbi Jonathan ben Uzziel a heavily visited grave thought to have powers for those that visit. The bus ride took me from hot and humid to less hot and much less humid. The scenery was interesting to see as we passed through Israeli cities, towns, villages and smaller. There were arab and druze towns. The bus drove past fields of olives, bananas, grapes and who knows what else. One thing I do want to note that is kinda of sad, so many Jewish communities, kibutzim, etc are surrounded with fences, gates, guards, etc. The arab towns had none of this. This tells me who is attacking who. When I got to Teveria (Tiberias) I called Rhonda to let her know I was getting near. I was to call her when I got to Rosh Pinna as it is only a few minutes from her house. She arrived and we had a little difficulty finding each other (and the place is not that big) but after a few minutes on the phone we met up and headed off. Rhonda took me up into the old town of Rosh Pinna and we walked around the ancient cobblestone streets and enjoyed the views. Yesterday (22nd) was the day I finally got to meet my cousin Rhonda, her husband Moshe and their kids, son in law, girlfriends, etc. Rhonda and Moshe came to Ra'anana and we had dinner at my most visited restaurant, the Sushi and Italian pair. We introduced verbally each of our families, and started to get to know each other. We then headed to Kfar Saba to a club Barby to her her son Edo, the drummer, and his band Pandora perform. It was as Edo described "rock" but it was much more soulful than American rock. I enjoyed it quite a bit I took a small video clip with two songs so you can see what I am talking about. Enjoy! The video still isn't uploading correctly... so I'll post this and add the video later when I can get it to upload. After my busy day in Jerusalem I slept quite well and woke up to goto my first day in Ulpan (Intensive Hebrew Class) I arrived before the 8am start and the office directed me to the class that I would be joining. It actually began in May and I'm joining them in the middle. The school director thinks this might be around the level I am currently at. The first 30 minutes or so was what I expected, a little mind boggling. After that I started to better understand what was going on and even got to participate a little. We had a couple of breaks and even had "music time" when another teacher came in the classroom with an electric piano and worked with us to sing Hebrew/Israeli songs. The chairs were harder than I recall from school days and we were given homework. In the same building as my bank is the local kosher McDonalds. Since it was after 1pm and I hadn't eaten much today, I decided to give it a go. It's been 8 years since I've eaten McDonalds hamburgers as that is when I started keeping kosher. So, I had a Big Mac, fries and a drink. My experience last time in Israel with Burger King led me to think I wouldn't find the fast food burger that good (it was good, just didn't find that I missed fast food) but I was surprised to find that I really enjoyed the burger and just the fact that I could again eat in McDonalds. I don't think this will become a staple in my diet, but it is here and I'm sure I'll eat there again. After eating I was heading home and stopped to buy the next needed item, a laundry basket. I will need to be doing laundry in the next couple of days, so having a way to carry it would be a good thing. I then headed back to the apartment. After all the running around I did over the last week I wanted an afternoon of peace and quiet and spent the afternoon catching up on the blog, e-mail, skype, etc. It was a good day and without a nap I think I am getting close to having adjusted to the time change, I can tell I'm not fully adjusted, but close. I made my first trip to Jerusalem on Sunday. Sunday is the first day of the week here in Israel. Everyone is getting where they need to be, you know like Monday in much of the rest of the world. The inter-city busses all stop at a large parking lot. It is about 1.5 miles from where I live. So I set out for a nice morning walk before 9:00am and made it there around 9:20. I figured out which area to wait for the correct bus and it arrived aroind 9:30 and after the walk in the morning sun the airconditioned bus felt good. I arrived at the Central Bus Station in Jerusalem around 11am. I had to pass through the metal detectors and my pocket knife set off the detector. Big eyes from the guard made me think I shouln't be carrying it. Another guard said "he's American" then the guard seemed to be ok and waved me through, Silvy met me there and suggest that since this was my first visit to Jerusalem since making Aliyah I needed to visit the Kotel (the Western Wall). So we set off for her car and as we walked along she snapped a picture of me on the new bridge in Jerusalem. We then found her car and headed for the Old City. We only had to drive around for 3 or 4 minutes to find a place to park with a two minute walk to the wall of the Old City. So a good opportunity for another picture. We then entered the city and made our way to the Kotel. We each visited our respective sides and took pics to commemorate the occation. I then had to catch a bus to goto the Nefesh b'Nefesh office to receive my Israeli ID card and meet up with most of the people from my flight. I also really appreciated the water they had. Afterwards I walked back to the Central Bus Station and caught my bus back to Ra'anana. I then had to walk home. I was trying to get back in time to finish some paperwork but didn't make it back before they left. So I went to the Italian/Sushi place I've been to twice before. Since I had sushi the previous visits, this time I had Italian. They now have a frequent diners card it cost me 59 shekels, for that I get 10% off all my future meals, a 50 shekel "gift" for my birthday (this thursday) 50 shekel "gift" after I spend 1000 shekels. So by Thursday I'll have most of my money back. So I have my first freqent diners card, since I've eaten there three times in less than a week I think I might return. If you are so inclined the arrival of the plane in Israel will be broadcast live on the web. The arrival is also part of a welcoming ceremony that will part of the webcast. So, if you have any curiosity, or are truly interested you can watch. The website says 12:30am, I've heard we could arrive as early as 11:30pm so you may want to start the video around then and then watch for it to actually start. The day started in Philadelphia at the FJMC (Men's Club) Convention where I got to join my friends for morning services and breakfast. We then drove to NYC to our hotel, parked the car and headed into the city. The kids wanted to shop in Chinatown, so that was our first stop. 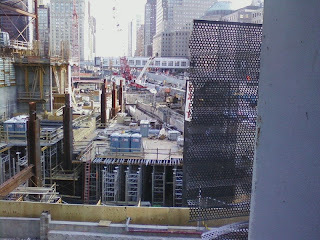 We then went to Ground Zero. I hadn't made it there before and since 9/11 had such an impact on me I felt I needed to visit there before leaving the country. So I snapped a pic to remember the visit by. We then headed to visit a friend and we had desert sitting in a park near his house. Sitting outside in July is such a weird concept coming from SC where is way too hot to even think about doing something like that. In the morning we'll find a bagel shop and have breakfast and then head to the airport. See you all from the "other side". All my bags are truly packed. 2 big rolling duffels, a backpack and my computer bag which will all make the big trip with me. I also have a small duffel that contains what I need for the next few days until I get on the plane. I just have to pack my toiletries in the morning and I will be done and ready to go... Hitting the road tomorrow, Saturday in DC. I will probably get to add a couple more entries to the blog before I get on the plane. I will be using my new video camera to record the events at JFK, on the plane and the arrival ceremony and such in Israel. Just in case I don't get to add any further entries... you can watch the plane arrive and the welcoming ceremony LIVE on the internet at the Nefesh b'Nefesh website. The plane arrives between 11:30pm and 12:15am Eastern time (8:30-9:15pm Pacific) on Monday evening/Tuesday early morning, I hope you can join in and watch it live, but if not, a day or so later it will be online in a recorded format. Even though I know my departure date is rapidly approaching, I know it's close since I can now see the long term forcast for that date. While it has been in the upper 90's here in Columbia with a heat index of over 105. It'l be nice and cool in Washington/Philadelphian next weekend around 84 and downright cold in New York at 80. I just finished my last Shabbat in Columbia before leaving to head to New York to catch my plane home. My mother is visiting from California. My office relocated this week and getting ready to move personally has truly worn me out. I led services last night and took a little indulgement and concluded the service with Hatikvah. I also read Haftorah today at services and Kaitlin and Emily led the Torah service. I got to schmooze with lots of my shul friends and reminded them of my open invitation to come visit me in Israel. I decided to move up from just typing and the occasional still shot. I ordered a digital video camera so I can capture events and more easily put them up on the web. Once on the web I'll be able to easily put them on this blog. So, now you'll get to see more of what happens in greater detail. I was looking back over the last week and realized I had another blogable moment that I completely overlooked. Last week I received an e-mail from Nefesh b'Nefesh with a link to an additional part of the online registration. This choice is completely optional but they wanted to know if I was changing my name. Many people stick with their English names, some change to the Hebrew name they were given by their parents and some do a hybrid of a Hebrew first name and their English last (family) name, but written phonetically in Hebrew. The ben Gershon part of my name means son of Gershon, my father's Hebrew first name. My children are ben Moshe, son of Moshe. So if one is good at keeping up with which children are from which father then you can keep this straight. It is an American thing to have two names before the "ben Gershon", to be like English first and middle names. In Israel they do not have middle names, so the Rachmiel would be confusing in Israel. So, I have chosen to change my first name to Moshe but keep my last name Gottlieb. All my Israeli documentation will have my Hebrew name as Moshe Gottlieb but all my American documentation will stay as it is now. I'll also have an Israeli document that links the two names so to help to avoid confusion, but in most cases people would only see one set of documentation so there wouldn't be confusion, unless they were looking at both passports or driver's licenses. So I completed the online request and they will confirm on the plane and when I get my Israeli ID it will have my new hybrid name. Are you confused yet? Tuesday morning I was at the airport at 6:15am to fly to Washington. I flew into Reagan National Airport. I have never flown into that airport before. The experience of landing was amazing. The view of the city was amazing. I could almost reach out and touch the Washington Monument. I can't even imagine how they ever decided to reopen that airport, one small deviation and you are in the city or on top of the pentagon. I then made my way to a kosher deli near Dupont Circle, Eli's Deli. They had a broad menu and while I was looking for the hot brisket sandwich, I saw the steak fajitas... hmm.... I can make a brisket sandwich, I've never made fajitas. They were very good and that hit the spot. Now to kill a little time before I could check into my hotel... I went to the National Zoo. It was hot and the animals were mostly hiding, but I saw the Elephants, orangutans, hippos, and the small mammals. Went to the hotel and got cleaned up. Why am I in DC? I came to attend a celebration for the olim processed by the Washington Aliyah office. The event was cosponsored by the Jewish Agency, Nefesh B'Nefesh and the Israeli Embassy. It was held at the embassy and we weren't supposed to disseminate the details as that would be a security problem with the embassy. So about a hundred gathered at the embassy mostly from the DC area, a couple of families from Richmond and myself the lone attendee from SC. The shaliach asked in advance if I would speak at the event and I took the presentation that I presented at my shul, shortened it and modified it to meet the goal of my presentation to describe who I am, how I came to decide to make Aliyah and what am I going to do when I get to Israel. I met several families that will be on the same flight that I'll be on. I met several young people who are on my flight as well who are going over to immediately join the IDF. I am honored to share my flight with people who put in all on the line to defend the country. I am honored to share the flight with the whole planeload as we are part of the present and future of Israel. Kol Ha'Kavod to us all! I then went back to the hotel to get a little sleep before having to be in a cab at 4:45 to head to the airport to head home. The flight was delayed in Cincinnati but I was still in my office before noon. I saw this on the Sussman's Blog (Thanks Romi) and had to make sure my blog readers got to see it as well. I was finishing packing my box of photographs and had a few photo albums to pack with the loose photos I had already packed. I flipped through the albums and had many walks down memory lane. I also came across an album I had long forgotten that I had in my possession. It is the album from my father's visit to Israel in January 1970. I spent more time in this album than any of the others. I looked at the itinerary. I looked at all the places he visited and the places that I'd now like to visit as well. He had meals with (don't know if he met them, but who knows) David Ben Gurion, Menachem Begin and Ezer Weizman. For me the really interesting (and cool) thing is that he went to the airport to greet new olim arriving from India. While he had no idea that his son would one day be making Aliyah, he got to experience the euphoria of people arriving and being there to greet them. So, while he may not be there to see my arrival, I now have a feeling that a piece of him is with me when I make Aliyah and experience the arrival at the same airport that he visited so many years ago (albeit slightly more developed today). There are lots of choices for cell service in Israel. All but one require you to have an Israeli ID number and bank account. The one that does not is geared to students, tourists and new olim (immigrants). The service offers both an Israeli and US numbers. Both numbers ring on the single cell phone so it will be easy for people in either country to call me. Before I leave they will send me my numbers and the sim card to go in my unlocked GSM phone. They have plans with a phone but for now my old phone is just fine (and cheaper too). The company is TalkNSave. A couple of posts ago I posted the text of what I said at the Rally at the SC Statehouse (moved inside because of rain). The different speakers presentations are now online at Grassroots 4 Israel. Nothing big has happened in the last week but I can update everyone with the little things that happened this week., particularly the last couple of days. Friday was my uncle's birthday and a lot of the family got together to celebrate. The last place you'd expect to find a nice Jewish boy who keeps kosher. The all-you-can-eat BBQ place. I went because of the family gathering not the BBQ. We had a great time and I enjoyed seeing a lot of the family in one place. They recognized that my move is getting near and that this was also a good opportunity for family and I to spend time together too. While the guest of honor got the big cake, they also had a decorated big cookie for me. Saturday at shul I was the board representative on the bimah and lead musaf too. Not too sure how many more things I'll get to daven but it's definitely something I thought about when I started. Emily finished her motorcycle class today and was one of only 4 class members to have passed the course. I'm glad that she has the class behind her, but still will worry about her on the bike, at least for foreseeable future. Maybe one day I'll be a little less apprehensive but that just the father in me. As for kids they finished with school and graduation is coming. Today I spent a couple hours packing my second box. This time it's the pictures. The reason it took so long.... I had to stop and look at some along the way and even had to scan two (to put on Facebook) since it'll be a few months probably before I see the pics again. I created a group on facebook for those of us sharing the Nefesh b'Nefesh flight together. So far about a dozen people have joined either the group or the actual flight event. (just 230 more to find). I put in my cancellation order for my cell service. Since my contract is not complete they have a process to cancel when you move overseas. After only having to talk to two people they told me that basically I cancel my service. I will get billed for the cancellation fees and when I get to Israel I am supposed to send them a copy of a bill (cell, internet, etc) and they'll then credit the fee. I said that was fine, but that they probably won't be able to read the bill. The guy was like "Can't you request it to be in English?" Yesterday was a good day in SC for Israel. A large group of people gathered on the grounds of the statehouse to rally in support of Israel. My last post shared the list of speakers and the words that came from each made me proud to be a South Carolinian. They spoke of the right of Israel to exist, to defend herself and the reasons for their beliefs. The flags, the music and the common beliefs bridged the differences in the religions that were in attendance. Who have thought a nice Jewish guy sitting and listening to a Baptist minister quote the bible and make connections from history, not run for the door thinking what am I doing here? The whole experience showed me how people can co-exist and focus on the similarities that bind us while respecting what makes us different. Maybe one day more of the world will be this way and not focus on the differences. When I was asked to speak here today I had no idea what I was even supposed to say. I am not a seasoned public speaker, which the next few minutes will prove. I don’t consider myself an activist, nor am I a politician; I don’t work for or speak for an organization that supports Israel. So who am I? I am an American. I am a South Carolinian and in just a few weeks I will also be Israeli. By gathering here today y’all share with me the idea that you can support Israel while not diminishing your support for South Carolina and the United States of America. I am moving to Israel for many reasons, but this is my way of “Put up or Shut up”. While moving to another country is not what everyone does to show support. I know many of you gathered here today don’t need much encouragement, but Supporting Israel is good for the world. Those of you, I know there must be one or two out there, that have a cell phone should thank Israel. Those of you that are ignoring calls and letting it go to voicemail should also thank Israel. Have you swallowed a camera for medical reasons? Thank Israel. If you have swallowed a camera for other reasons, I don’t think we want to know about it… I could go on and on. Israel is an innovator and has made the world a better place. Israel is central to the monotheistic religions of the world. We share a belief of one g-d. We share a sense of fairness. We share a responsibility of defending what is right. We want the world to be a better place. There are those out there that try to focus on the unfortunate events that have occurred over the years in the defense of the Israeli way of life. There are many who think Israel has been evil and malicious in these events. If Mexico were bombing San Diego I don’t think we’d sit quietly and let it go on for years upon years. Bibi Netanyahu said “if the Arabs laid down their arms there would no war, if Israel laid down its arms there would be no Israel.” There is no crystal ball, no magic; the hope is for peace and prosperity. We will continue to work towards this goal and maybe one day this won’t be a hope any longer. Israel needs us, continue to support her. Speak out, join organizations, visit Israel and if you are so inclined move there. Am Darom Carolina Chai! – The people of South Carolina Live! Am Artzot Habrit Chai! – The people of the USA Live! Next Sunday will be a Gathering, a rally, or some such thing at the South Carolina Statehouse in support of Israel. A group of people have pulled this together with an amazing lineup of speakers. I have also been asked to speak and have agreed to do so, but I do feel a little outgunned, but it's a program on a subject that means a lot to me, so I go into this with genuine excitement. I have never truly spoken in public, speaking in shul to a room of people that I mostly know or even a business presentation to 8 people that I don't know is not the same as speaking in front of the central government building, on the steps, with cameras, reporters, supporters and probably a few people who are not supportive of Israel. I would like to note that this has been assembled by a group of people who are true friends and lovers of the State of Israel. Not all are Jewish. I met a couple "Zionistic Christians" when I was volunteering in the IDF, but didn't realize that there are actually a good number, even right here in South Carolina. So, my friends if you are in the area next Sunday, May 17th, join us in front of the SC Statehouse from 2 until 4, rain or shine, but I'm hoping for shine. Wear your Blue and White! Over the last couple of months I have made friends online with others that are making aliyah this year. One will be on the same flight that I will be one, another is trying and others are on different flights. As the year progresses I am enjoying seeing their posts to Facebook. Their status many times resemble what mine have been. I did all of my paperwork and such earlier than most people so they are now doing things such as waiting for approvals and visas which I was fortunate enough to have already completed. As they post their status I am recalling each time how I felt at those milestones and know they must be having similar responses. I am happy for them! I don't mind either that their joy makes me feel good too. קדשים תהיו כי קדוש אני יי אלהיכם You must be holy, since I am God your Lord [and] I am holy. He proceeds to tell us how we can do that in the form of commandments. What is really being told to us is that we have to live a certain way, in order to be holy. In today’s world it means to live a Jewish life following Jewish law. We have learned that we don’t know everything at once and we have to grow into “our” Jewishness. I grew up in this community and recall Sunday School at the education building next to the old JCC. I recall the JNF Tzedakah boxes. I recall the posters of Israel, Jerusalem, the kibbutzim, the chalutziim (the pioneers). I especially remember always singing Hatikvah at the end of each school day. We moved to this building and some of the posters didn’t follow but we continued to sing, I became involved in USY. I considered becoming a Rabbi. I let society dictate confusion and assimilated myself into secular life and for many years I did not attend shul or do anything Jewish. It took Mormon missionaries in Utah to push me back into the shul. That is a story for a different day. But they also started me down a better pathway of life. I reconnected to my roots, both in general family connections, but also to my heritage. When I moved to Atlanta I was seeking out ways to incorporate Judaism into my everyday life. I found a Jewish outdoor group, Mosaic. Named for the first Jewish hiker, you know… Moses… I went to shul regularly, I went on weekly hikes and found other things to volunteer in within the community. I was feeling pretty good about my reconnection. Sept 8th 2001 shared the parsha from my Bar Mitzvah. This was the 3rd year of the triennial so Maftir matched from years ago when I chanted those words. The Haftorah was of course the same, while I don’t remember who chanted it that day I recall that I was humming along, remembering those words from so long ago. My heritage, my history and my future. I was moved that Shabbat. Three days later the world shook. September 11th, the Gregorian date of my Bar Mitzvah, was now forever shared with the tragedy in New York, DC and Pennsylvania. I did not know anyone that died, but I was somehow connected. My shul in Atlanta had daily discussions followed by the evening minyan. I went each day, somewhat in shock, but comforted by being with b’nei yisrael, the children of Israel. I continued my participation in Mosaic events, camping, kayaking, hiking and enjoying that all the participants were all Jewish, we didn’t’ travel on Shabbat, we only ate kosher food at our events. I now had a portion of my life that wasn’t ritualistic but allowed me to live a Jewishly integrated “regular life”. I was on a hike in the Georgia Mountains and was walking along chatting with a friend. We chatted about how he had traveled to Israel and volunteered in the IDF. I was intrigued and asked more questions and basically learned about the Sar-El organization that facilitates civilians volunteering in the IDF. I went home from that hike and thought to myself; that sounds really cool. I researched the organization and within a couple weeks I was signed up to volunteer for 3 weeks. I didn’t leave for a couple of months, but I then became an information junkie regarding Israel. I read everything I could on the internet, bought travel books. I recalled stories from years ago in Sunday and Hebrew School and the places we studied about were about to not be distant pictures but places I could and would actually visit. The Sar-El organization sent me all my paperwork and documents to better prepare me for my travels. One thing that struck me was they mentioned in their documentation, that 46% of people that come on this program eventually make Aliyah. I thought to myself “that isn’t going to be me”. I received several other documents from them before my trip. They all stated the same statistic and I still thought “that isn’t going to be me”. I went to Israel, when I got off the plane, I had the cliché response, but it was genuine, I felt “at home”. Riding in the car and seeing all the signs in Hebrew left me thinking this is really cool. I am in a Jewish place where being Jewish is “normal”. The entire time I was volunteering they reminded us, 46% eventually make Aliyah… And I said it wasn’t going to be me. I rode on busses and listened to people actually speaking Hebrew. It wasn’t the language of the synagogue, but the language of life, everyday life. There were several bombings while I was there and that was weird, but I didn’t want to leave. I was part of this and I belonged. I went on a hike with the Mosaic group based in Jerusalem and unlike the Georgia group where we might see a civil war site; we hiked in the valley where David slew Goliath. That left me with a feeling of understanding this was the land of my ancestors and our history was all around me. Spending time in Jerusalem, the old city, the Western Wall just added to this experience. I spent Yom Yerushalayim, Jerusalem Day, in Jerusalem. Not as a spectator, but a participant. I marched in the parade, waving a flag and ending up at the Western Wall. There was a huge gathering of Israelis. Music playing, dancing and general celebration. It didn’t matter that I wasn’t Israeli, didn’t hardly understand a word of what was going on. They pulled me in, I danced and was an integral part of the celebration. I belonged and they were telling me this, just not in words. I returned from Israel in May 2002. That summer I read about a charter planeload of North Americans that all were making Aliyah together with the help of a new organization, Nefesh B’Nefesh, Jewish Souls United. I thought that was really cool and at this point didn’t think much more about it. Over the next couple of months I read more and more about Nefesh B’Nefesh and in December I read that they were chartering another plane. I was now thinking ok, “normal people” make Aliyah. People leave North America and move to Israel, just because they want to. My mind was made up. I wanted to be in Israel. I had been wrong. This was me. I downloaded the application from Nefesh B’Nefesh and started to fill it out. I talked with a child psychologist and was told I either needed to do it right then or wait until my kids graduated. I did some soul searching and decided that right then was not ideal for many reasons, but if I were to wait until the kids were older then it would be their decision instead of me making them go. So, knowing that they would graduate in June 2009 I now had a target date. When I told people that I was making aliyah in six and half years they were saying, YEAH right, today I am telling you about my journey to make Aliyah, six and a half years later. Now I feel many are saying yeah, RIGHT, the same words but the emphasis is on the RIGHT. What else have I learned about during my journey to this point in my life? The orthodox don’t have a monopoly on Aliyah. Conservative Jews make Aliyah. Non-religious Jews make Aliyah. People actually move to Israel because it is an amazing place to live, to raise a family, have a great career. Oh yeah, live Jewishly without having to make much of an effort. Assimilation is a good thing, in Israel. While we should do everything we can to be supportive of our intermarried friends and family it is still something we have work at. In Israel you would have to work hard just to be intermarried. Israel is constantly trying to grow and improve. Israel is constantly seeking new people to grow the majority but more importantly bring new ideas and strength to the state. I feel I have a lot to offer and to contribute to the future of the State of Israel. The founder of Nefesh B’Nefesh, Rabbi Yehoshua Fass has stated that we are not running from something, but running to something. I couldn’t agree more. Mark Twain once asked us what our secret is. How is it that despite our meager numbers we have stood the test of time? How is it that despite others turning their heads to our suffering, we have survived? How is it that we have outlasted the greatest empires? He, and the world, saw us as the few, as the weak. They measured us by numeric strength. Mr. Twain was missing one piece of crucial information when he wrote his remarks. He saw us as individuals; he did not see the rows upon rows of ancestors that stood and still stand behind us. With his question he missed the point; we have survived because we are a 'We' and not an 'I'. While you may not be getting on the plane, many of you grew up with me here. You saw the same things; you heard the same things and did the same things. I take with me a piece of this community and you are all invited to join me in Israel, be it for a day, a week, a month, a year or even making Aliyah. I hope I can share a Shabbat meal with each of you when you come. Follow your heart, I am. Please stand and join me in the singing of Hatikvah.